I can’t believe an entire week has flown by already! Let me tell you, we have been BUSY. If you missed it, last week I shared my plans for our Modern Industrial Guest Bedroom. I have four more weeks of the #OneRoomChallenge to create my beautiful space, along with a ton of other amazing designers and bloggers. 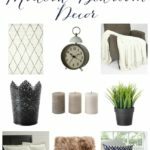 Visit Calling it Home to be inspired by all of the decor! 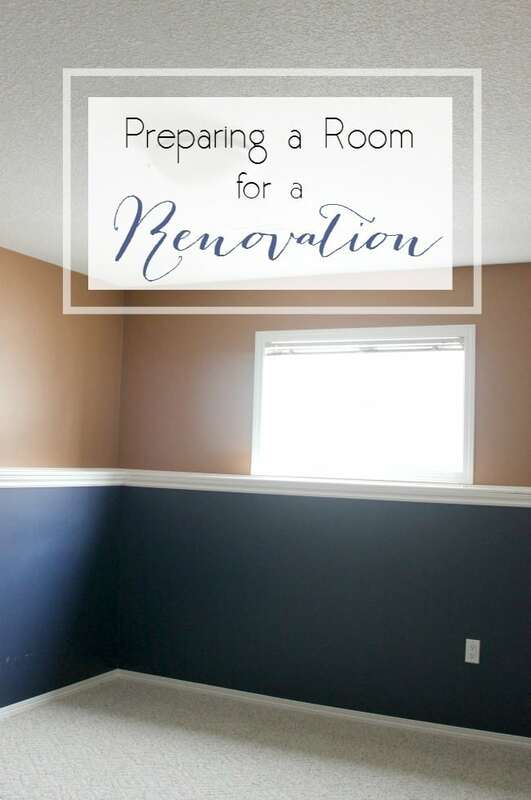 I’m sharing what we’ve been up to, and everything we did to prepare our room for the renovation. 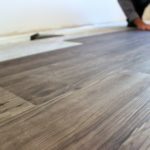 Remove moldings – You can just tape them off too, but if you are changing the flooring, or taking the time to update the moldings (like we are! ), then this is the time to remove them. 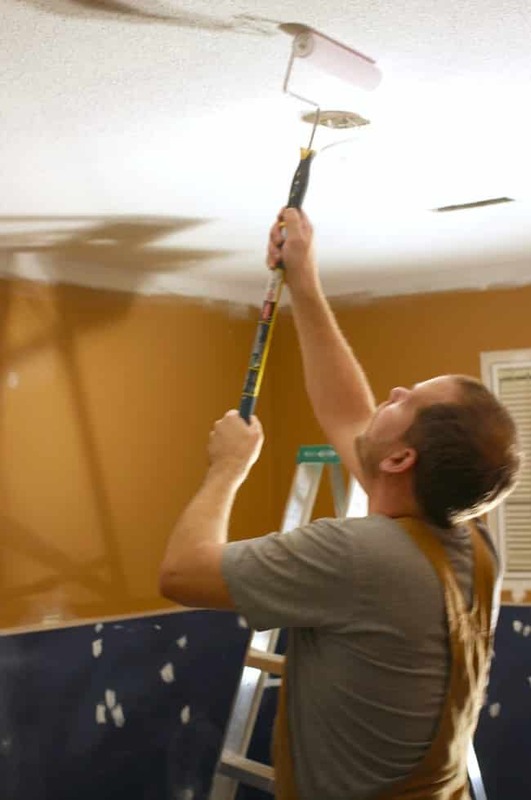 Renovations are always a great time to repaint and refresh that old trim too! 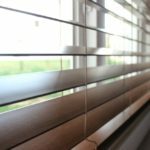 Remove window coverings – we are replacing the blinds, but removing curtains and rods just makes life simpler! Remove outlet covers – Trying to paint carefully around them never works. The covers are SUPER easy to remove, and then you can paint right underneath them! 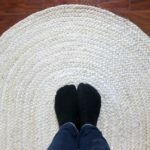 Remove carpet – only if you are replacing it :) In this case we did do this! 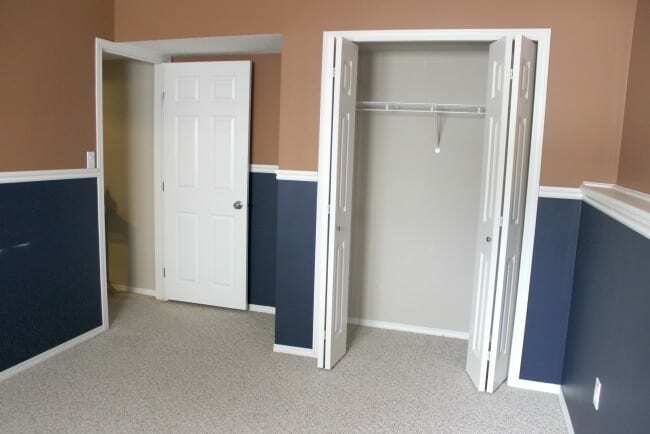 Remove closet organizers and doors – again, anytime you are painting a room is the perfect time to repaint main doors, closet doors and inside the closets. Pull them off and paint them to match the trim. The little things (like fresh paint) make the biggest impact! 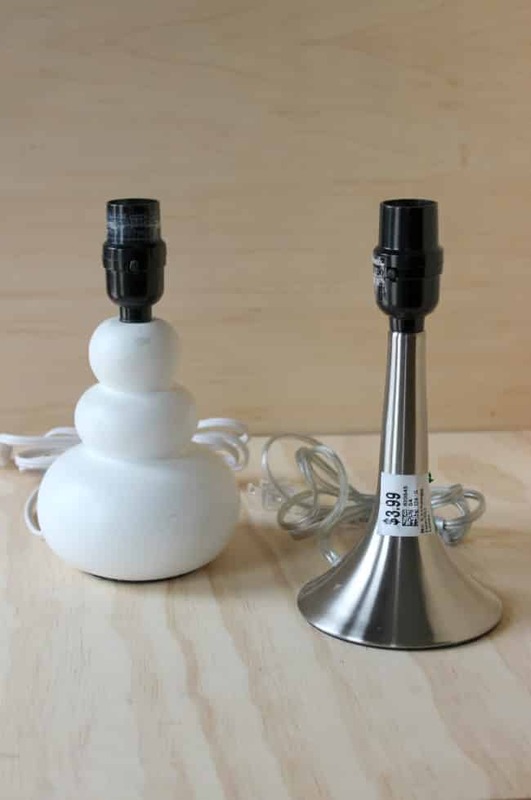 Remove light fixtures – Since we always paint the ceiling when we re-paint (refresh everything!) it is easiest to remove the light fixtures, even if the same one is going back up. 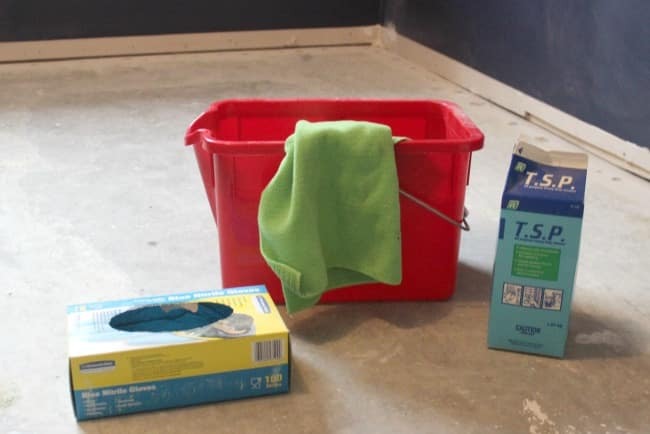 Clean walls – We use gloves, rags, and TSP. 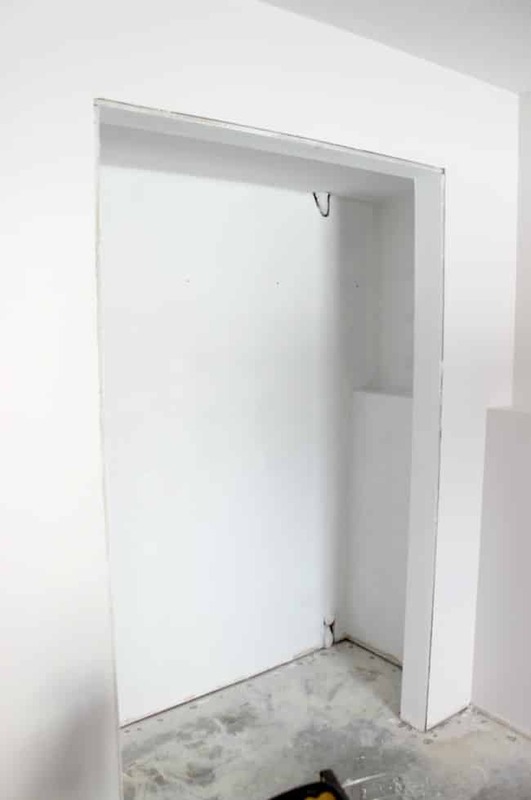 We wash down all the walls to remove anything and to give the new paint the best possible adherence. Putty all holes/marks – Soooo important before you paint is to putty all of the holes – you know your room has some! Sand – After you putty, you always want to sand off those bits sticking off the wall. 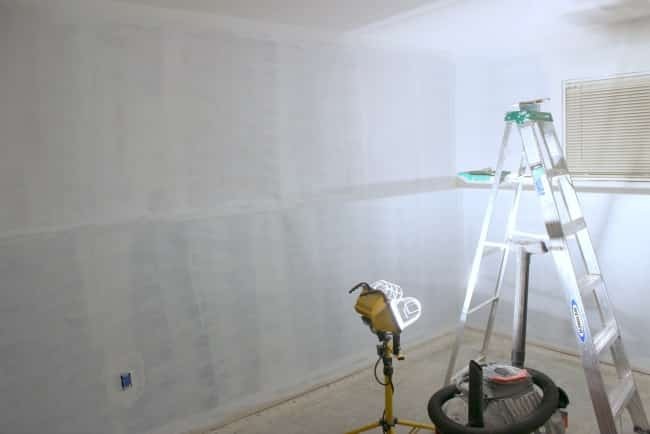 Also there may be high spots on the walls from previous drywall install or repairs. I’m pretty sure this room belonged to teenage boys before us. Look at how much we had to putty and sand!! UNREAL! Finally, we are ready to paint!! 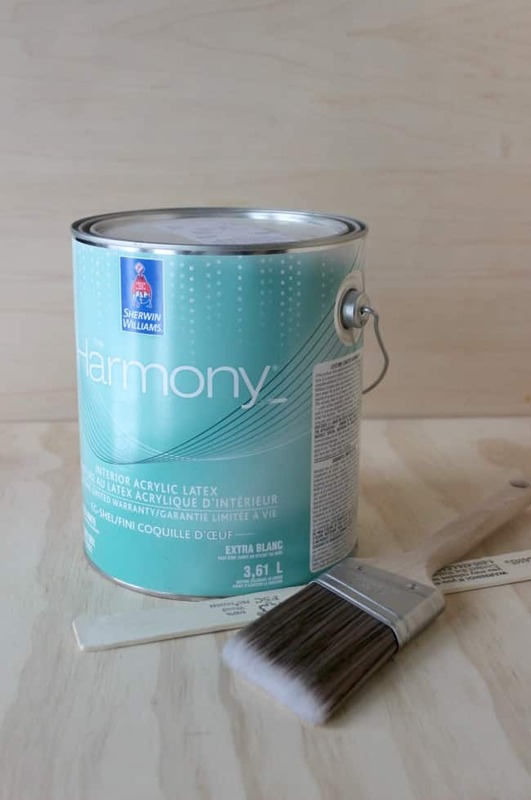 We used White Heron by Sherwin Williams to paint the room, and even after one coat the room looked 100x brighter! Most of our painting was done in the middle of the night. Whether day or night, we always use an industrial light to make sure the space is lit up nicely. After many hours, we are finally done painting the ceiling, closet, and walls. Heron White was the perfect choice for the space. It’s just slightly off-white, so it stands out against are perfectly white ceiling and trim. It is the PERFECT colour for a basement! I also had time to hit the thrift store this week, and look what I found! These old lights don’t look like much, but they are the start of my new DIY bedside pendant lights! Eeek!! SOO excited for this one. Stay tuned next week…. That’s a lot of mudding!! Definitely the worst prep step! Also that paint looks like it covers really well-even after one coat the blue is almost gone! Did one can do the whole room? Yes! The paint was honestly amazing! We had to open a second can, but aaaalmost did it with one can. We had about one wall left. I’ll be following in your footsteps this weekend! We are painting the entire room white as well. I hope it turns out as pretty as this has! That color made the room look 10 times better already!! I’m so excited to see how that chair turns out. I love thrift shop find! I am interested to see how you turn those lamps into pendents! Great tips for prep work. Doing the prep initially makes the job so much easier (I learned that the hard way). What a difference the white paint made in this room-I love it already! 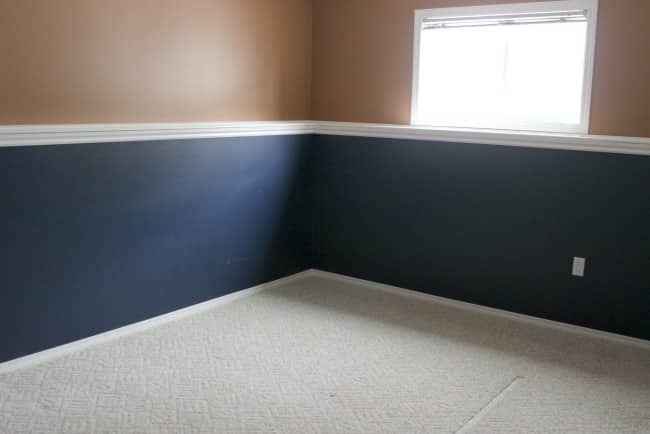 That paint certainly brightened up the space. Love the chair too! 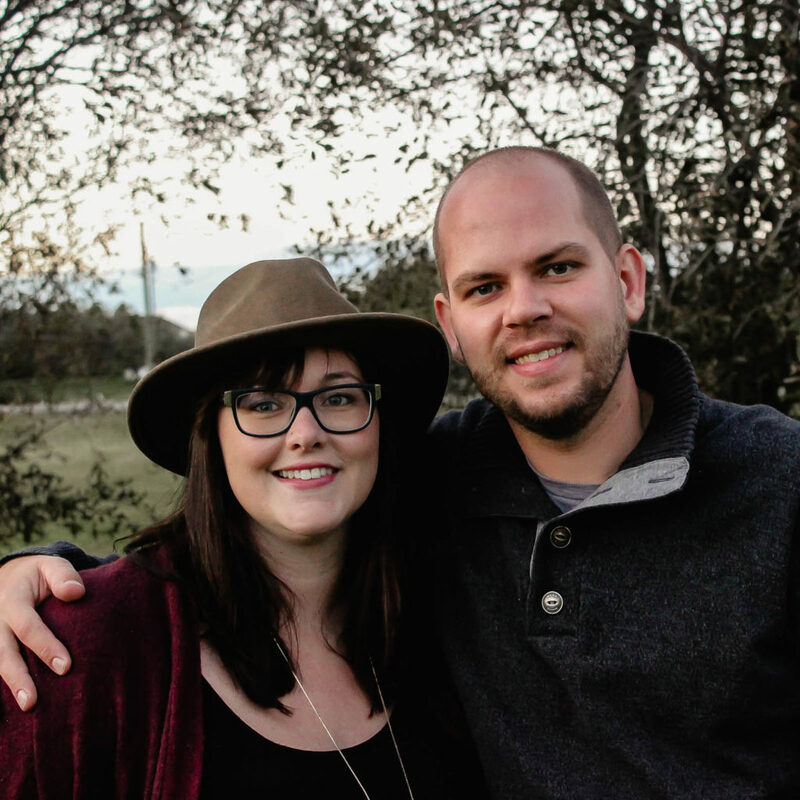 Oh my gosh Lindi … that chair!!! SO cool! Great progress so far, looking forward to seeing what you get up to in the week to come! You go, Lindi! Love the white paint already! Can’t wait to see all you do! (And awesome thrift store finds)! Good luck this week, friend! Lindi I adore the direction that your room is headed towards! You did SO much better than I did in my room this week. You’ve made great progress! The prep work is half the battle. I haven’t even torn off the wallpaper of the walls for my ORC so I’m feeling behind already, ha! Wow, Lindi! That really, really brightens up the space and makes it look so much bigger. I love the industrial look and can’t wait to see where you go next with this room. 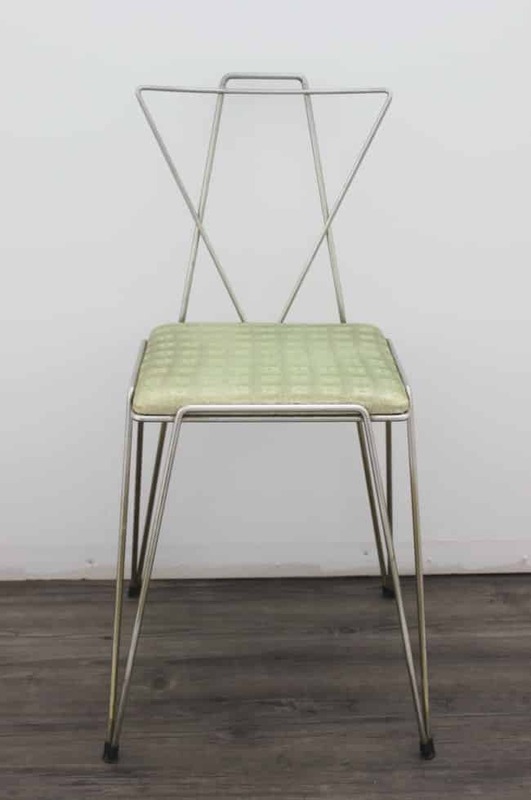 Hi Lindi – LOVE the chair! What a find! You guys are so organized. 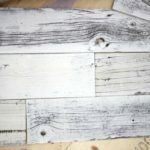 You should pop over to my blog to read my 6 tips when renovating your home (lol) We weren’t quite as organized! The white will really be nice. Looking forward to seeing your progress. a fresh coat of paint does a world of difference! Lindi this looks amazing. I am loving those pendant lights and can’t wait to see them in your room week 3. That chair is FABULOUS!!! I love how white can just transform a room. It’s so much brighter now! I don’t know about you but I’m over room painting! That chair! It’s adorable! I can’t wait to see what you cover the seat with. See you next week! 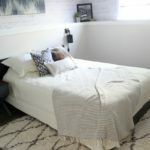 Your off to a great start on this bedroom makeover! I love that chair!!!!! 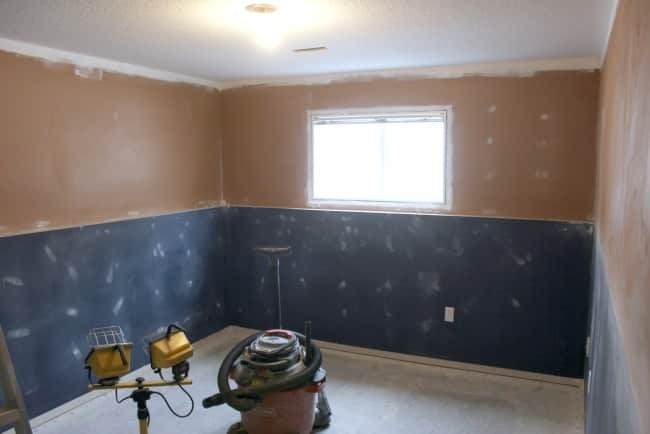 Can’t wait to see the progress on this room. I would like to invite you to link up to our party, Sweet Inspiration. It starts on Friday and runs until Tuesday. Hope to see you there. Lindi what a makeover and just from the paint alone. Ahh, the power of paint. I t makes a huge difference. The tips you gave us are spot on! Looking forward to your ORC progress and thank you for joining us over at Sweet Inspiration. 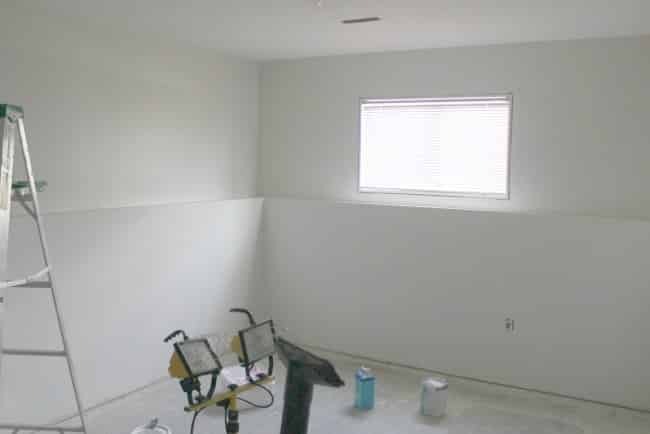 The room looks so much larger when its painted all white. I’m excited to see the rest.